Gluten Free Butterscotch Pudding | Great gluten free recipes for every occasion. When I was a kid, I was super close to one of my grandmothers. It was just her, and she used to stay with us quite often on the weekends. She definitely helped out around the house a lot, and I’m sure she cooked lots of meals for us. But for my brother and me she was most famous for making two things: real brewed iced tea with tons of sugar (not the powdered stuff! ), and pudding. Her sweet tooth was (and still is) legendary. She used to say that she was born with a sugar deficiency and had to spend the rest of her life making up for it. Who was I to argue? On Monday mornings as I marched off to school, I was nothing short of heartbroken at her leaving. But if we were really really lucky, she would have made pudding and poured it into juice glasses then left it to set up on the counter, waiting for us after school. So even though there are already plenty of pudding recipes on the blog, there’s always room for one more. This time, smooth, rich gluten free butterscotch pudding. And it’ll be waiting for my kids when they get home today from school. My grandmother most definitely made her pudding from a box (and I couldn’t possibly have cared less—much less even knew back then that you could make it without the box, but for sure it was the cooked stuff, not instant pudding which doesn’t even taste like pudding to me), and it was plenty good enough for us. But when I make pudding these days, I always make it from scratch because, even though we’re fine with corn in my house, I don’t care for the way pudding “leaks” as it sets up and cools when it’s made with cornstarch as a thickener. 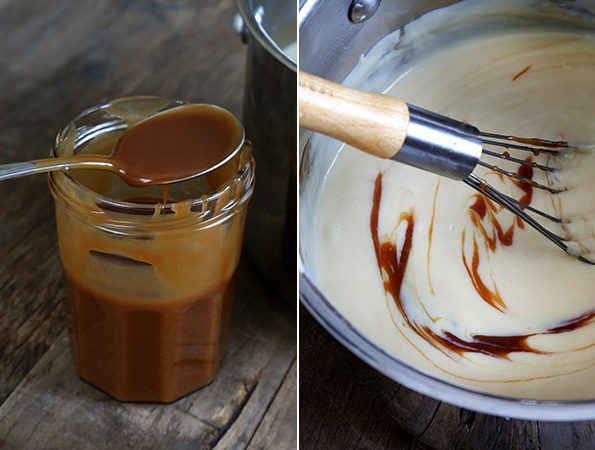 The butterscotch sauce can be made days and days ahead of time. The pudding itself can even be made days ahead of time. I don’t like to let it set up in the refrigerator, though, since I like the smoothness of both the butterscotch and the pudding at room temperature. It tastes more like custard to me that way. But it’s up to you—and you can always store the puddings in the refrigerator and then allow them to soften to room temperature before serving. Either way, pudding is near and dear to my heart. I kind of suspect that my no-nonsense grandmother would think I was crazy to go through all this fuss, but she most certainly would have grabbed a spoon and joined in on the eating. First, make the butterscotch sauce. * In a medium-size, heavy-bottom saucepan, melt the butter over medium heat. Add the brown sugar, and stir until combined. Stir in the granulated sugar, and cook over medium-low heat until smooth, stirring frequently. The mixture will clump, and eventually melt after about 3 minutes. Remove the saucepan from the heat and, whisking constantly, add the cream. The mixture will bubble quite a lot, and the sugar may seize. It will melt again, though. Continue whisking until the bubbling subsides. Return the saucepan to medium heat and, whisking occasionally, bring to a simmer. Continue to cook, whisking occasionally, for about 5 minutes or until the mixture is slightly reduced and coats the back of a spoon. Remove from the heat, and add the vanilla and salt. Set aside to cool. *The butterscotch sauce can be made up to 5 days ahead of time and stored, covered, in the refrigerator. As it will harden when chilled, before using in the pudding and to serve, the sauce must be warmed in a saucepan on the stovetop or in the microwave, just until melted and smooth, but not hot. Make the pudding. In a medium-size heat-safe bowl, place the flour blend, sugar and salt, and whisk to combine well. Add 1/2 cup (4 fl. oz.) of the milk, and then the egg yolks, whisking to combine after each addition. The mixture should be smooth. Set it aside. In a medium-size heavy-bottom saucepan, place the remaining 2 1/2 cups (20 fl. oz.) milk and bring to a simmer over medium heat. Once the milk reaches a simmer, remove the saucepan from the heat and slowly trickle the hot milk into the bowl with the egg mixture, whisking constantly to combine. Pour the whole mixture back into the saucepan and return to the heat. Cook, whisking constantly, over medium-high heat until the whisk leaves a visible trail in the pudding as you whisk it (2 to 3 minutes). Remove the pan from the heat, add the chopped butter and the vanilla, and about half of the butterscotch sauce, and stir until the pudding is smooth. Pour into a large bowl and place plastic wrap directly on the surface of the pudding to prevent it from forming a skin. Set aside to cool briefly. Assemble the individual servings. 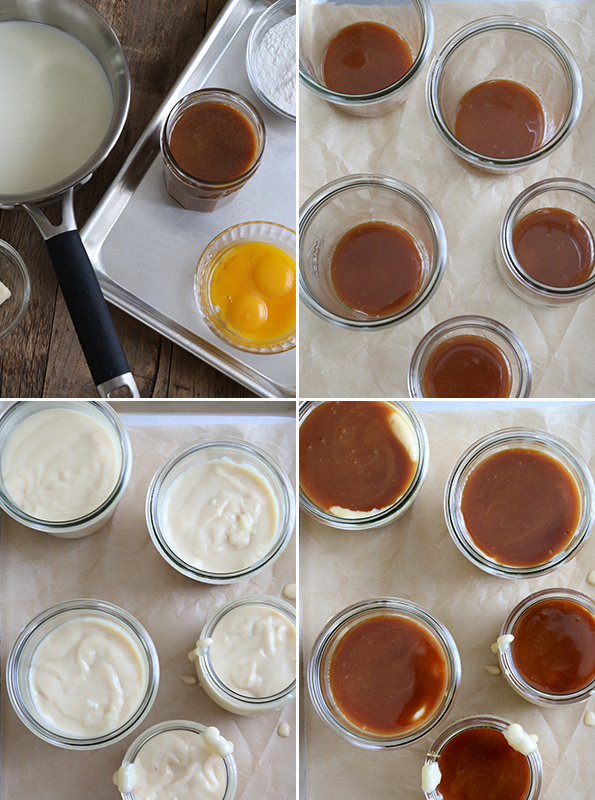 Pour about half of the remaining butterscotch sauce into a layer on the bottom of each of 6 small containers, each about 6 ounces in capacity. 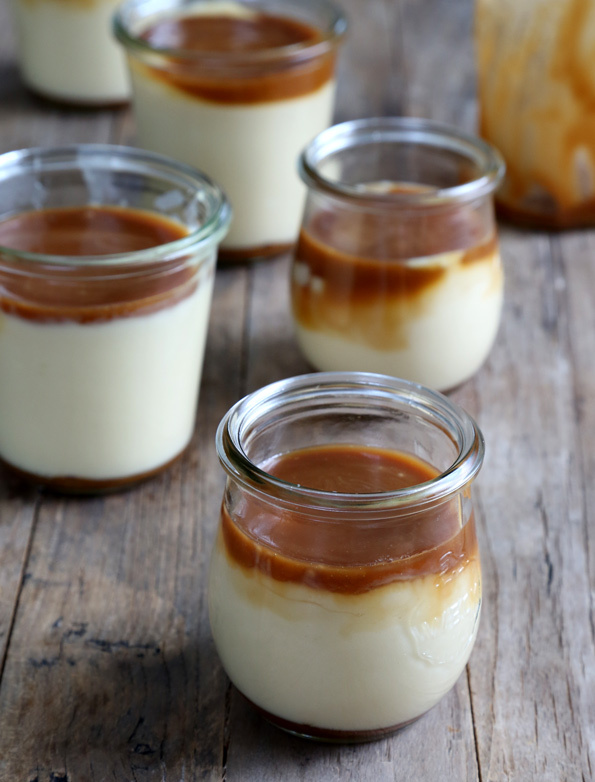 Divide the pudding evenly among the containers, and cover with the remaining butterscotch sauce, evenly divided among them. Allow to cool to room temperature, uncovered. The pudding can be served at room temperature or covered and stored in the refrigerator for up to 3 days before serving. If chilled, the butterscotch sauce will harden a bit. well i just i just made up my mind on what i’m making for sunday dessert! thanks again nicole! my family will love this. Hi, Rina, The small ones are Weck jars. They’re available in lots of places. You can find them at Crate & Barrel, usually, and at weckjars.com in the U.S., too. The larger jar, the one with the butterscotch sauce in it, is a Le Parfait jam jar. Those can be much harder to find in the U.S. I have bought them at small shops in person, but they are also often available at Sur La Table. I love canning and mason jars! Cool! Thanks! I will keep my eye open for them (in Canada). Actually, I will be visiting a friend in Stratford, ON, where there is a cool kitchenware shop… and now I have an excuse to scour it for Weck jars! Any thoughts on also making this dairy free? I’m afraid I really don’t know, Tana, since you’d have to replace the heavy whipping cream, butter and the milk. If you have favorite subs you use for those things, I’d start there! I just made some bread today with butterscotch and it crossed my mind to make butterscotch sauce! You answered my prayers! Can’t wait to make this. That pudding and butterscotch sauce looks amazing, Nicole! I also have a no-nonsense grandmother that before her passing didn’t like a lot of fuss (with food or attention); some of her old, classic comfort food recipes are still near and dear to my heart although, like you, I’ve given a few of them a modern tweak here or there. As always, your photography is astounding! Mostly, I loved this throwback to food that influenced you while you were young. Can you actually stir the butterscotch sauce into the pudding so the whole thing is color of butterscotch and then put it into a baked gluten free pie crust for it to be butterscotch pie? That is my favorite pie that mom made for Thanksgiving (along with her awesome apple pies). Mare, the instructions have you stir half of the butterscotch into the pudding itself, and then use the other half to assemble the puddings. I don’t know if this would work baked, and I don’t recommend stirring all of the butterscotch into the pudding. I would not bake the pie with the pudding in it. The crust would be prebaked and the pudding would set in the baked crust. I am going to try this and let you know! This looks amazing! And really? Almost as easy as a box and of course much yummier. I’m going to try it with coconut cream and see what happens. Your grandma and I just might be soul sisters as I also was born with a sugar deficiency! So awesome, thanks Nicole! Oh no, Lucy! Still on strike? :( I think you’ll need a particular afternoon snack just for you, then! Hi Nicole! This recipe is going to be a huge hit here with my three boys. Thanks for helping me keep them in the snacks. I’m pretty sure I never made food this good before we went gluten free! That’s awesome, Starr! I’m all about the snacks. I like to have options, and want you to have the same! I’m afraid not, Cathy. This isn’t a grain-free recipe. You’d need a recipe formulated specifically for that. Sorry! You could use corn starch, or tapioca starch. Doesn’t need to be a flour mix. I’ve made vanilla pudding that way for years, also chocolate and banana. Linda, I’m glad you found something that works for you, but corn is a grain so she wouldn’t be able to use cornstarch. I don’t know if tapioca starch would work to thicken pudding without making it gummy, as it is a rather stretchy starch. And Cathy asked about nut flours, which will not work in this recipe.